SPARKLES ON BOW AND HEELS. DISNEY WEDDING SHOES. USED IN A WEDDING FASHION SHOW. WHITE SATIN. STUART WEITZMAN. Condition is New with box. Shipped with USPS Priority Mail. Classical elegance abounds in these black satin Prada heels with small black beads to accent their beauty. Excellent Pre-owned condition. These are beautiful sandals that have never been worn. Small scratch on the heel of one shoe. Women’s Alfani High heels. Jean style in black satin. Slight platform. About 4” high heel. Beading and gem design on toe. Buckle fasten on outside of foot. Women’s US size 6. Excellent used condition. One small bead missing from left shoe, see photo #3. Original purchaser, worn once. No damage or marks on heel. Stored in original box. Pet and smoke free home. Fast shipping. Ships with out box. No returns. Questions please ask. Beautiful black satin Badgley Mischka sling back shoe. Size 8 1/2. Made in Italy. Stuart Weitzman Designer Shoes. V-cut vamp for a leggy look along with criss-cross detailing with marquis cut outs. 5.25" heel (including a 3/4" platform). Black satin upper. Made in Spain. Color can be slightly different from the picture. Elegant little evening shoe with a stylish oversized bow accenting a sleek pointed toe. Silk and leather. Made in Italy. 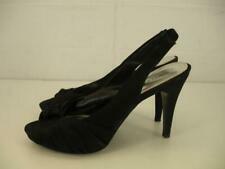 CHINESE LAUNDRY Asymmetrical Black Heeled Shoes Women’s Size 9. They are used but in excellent condition - only worn twice. They are black dulled satin with a 4 inch heel. Perfect for a date night or cocktail party! About Jimmy Choo Condition: Pre-owned in excellent condition. Leather insole, lining, and sole. Heel height: 4.5". Color: Black. Nine West Red Satin Heels 10.5 M NWOB. Never worn! Large rose adorns the vamp. Perfect for weddings, parties, prom, or a night out! Ships with USPS Priority Mail. New BCBG Maxazria high heels, slingback. 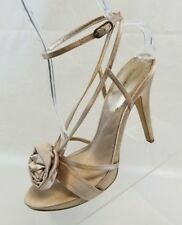 The amazing BCBG Maxazria high heels are new and never worn. They are stunning, elegant and versatile. The color will go with a lot of outfits. The neutral color will give you an elongated look. Gianni Bini Gold Shoes. Condition is Pre-owned. Shipped with USPS Priority Mail. Cavallino Slingback Stilettos pumps purchased in Italy for a cocktail party. Stiletto pumps Size 37 EU -7 US Turquoise microbeads and turquoise glitter design over light baby blue satin. Silver and baby blue leather trim in overall excellent used condition. Any questions please don't hesitate to send me a message. For Sale Is this GORGEOUS Pair of Size 7.5 Ladies BLACK LEATHER & SATIN HIGH HEELS. LARGE 3" RHINESTONE DRAGONFLY ACCENT. Never Worn. No Scuffs, ALL Stones Intact, Clear and SUPER Nice sparkle. Extra insole added. Stunning shoes! Satin uppers, leather sole. When you are finished, you can check out. 100% authentic! We believe that pictures speak louder than words and do our best to show several photographs of each item, including any flaws we find. CHRISTIAN LOUBOUTIN PLISSETA 140 CREPE SATIN SLINGBACK HEELS. Elasticated slingback. Satin wrapped heel. Satin upper / Leather insole and sole. Sky high platform. Heel Height-5.75". Platform-2.5". Width at Widest Point-2.5". Chocolate brown satin slingback with a rhinestone accent, 2 1/4" heel. This is a gorgeous pair of evening heels from Badgley Mischka featuring beading over a black satin strap across the toes. They have an adjustable sling back strap with buckle closure. Genuine leather insole and outer sole. Ankle strap with buckle closing. In f ai r condition, madei n It al y, g ol d to ne o n th e inside,t he s ho e itselfi s ma de of sa ti n.
Style: Satin Rose Slingbacks. Length (Heel to Toe Outer Soles): 11". Upper Construction: Satin. Heel Height: 5 Color: Beige.